Ok all – let’s talk Keto. 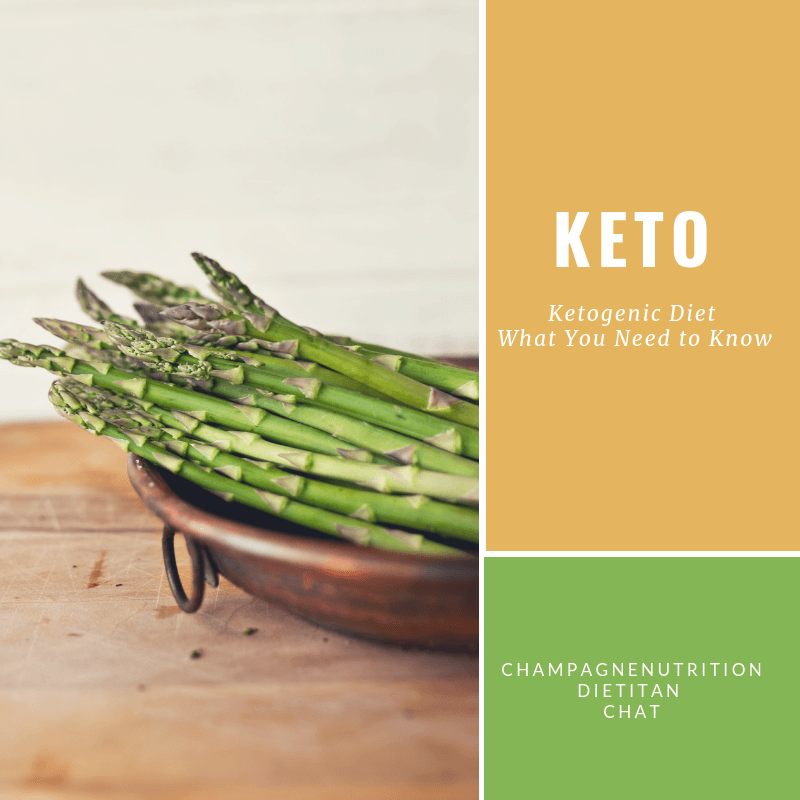 It’s keto month at Champagne Nutrition and if you’re following along on twitter or facebook, I’m posting every few days on keto subjects. I’ve never seen a hotter diet trend and I’ve also never seen so much confusion and misinformation on one subject. This is all about the ketogenic diet…what you need to know. I talk about keto a lot. I’ve given over 20 interviews on the subject and written articles about the science there, too. The most important thing is that you know what it isÂ as we get started. I hear a lot of people say that they’re following a ketogenic diet but they’re actually far from it. There are a couple articles you should read to better understand the basics including this one I wrote for Food&Nutrition Magazine and also this one in Huffington Post. This is a very high fat, low carb diet. Eliminated foods include all fruit except a small amount of berries on occasion for some people, all grains and starchy veggies, beans, most soy products, some dairy, limits on portions of nuts/seeds. Artificial sweeteners can be used. Compare this to the general acceptable macronutrient distribution range (AMDR) which is: 45-65 percent of calories from carbs; 10-35 percent from protein; and 20-35 percent from fat. Keto is very different than how many people normally eat. It was used originally to treat people with epilepsy who weren’t responding well to medications. It’s quite effective for a variety of medical needs but it should be monitored by a medical team. There is some evidence now in humans that it’s effective for weight loss which is why I see most people using it. Less about macronutrient breakdown and more about overall food choices. Based on what people in the Paleolithic Era (earliest humans until 40,000 BC – 8000 BC) ate; a take on the “traditional” human diet. Though, this is a large span of time and humans inhabited many parts of the earth. They ate a varied diet and there isn’t one true “Paleo” diet, historically speaking. No grains, beans, soy, corn, dairy, alcohol. It is based on meat, fish, eggs, nuts, seeds, fruits, all veggies (even starchy), fat (coconut oil, olive oil, avocado oil, ghee), raw sugar/honey/stevia. For many, is part of a “Paleo” philosophy based on physical movement and exercise. Simply put, the ketogenic diet is very high fat and very low carb. Take one wrong step and you’re not in ketosis any longer. Here’s my piece on “cheat days” on keto if you’re interested. If you’re eating barbecue sauce, you’re not keto. If you drink a margarita, you’re not keto. If you eat an apple, you may not be keto. It’s a very restrictive diet. And once you’re not in ketosis, it will take you a period of time to get back into it. To know if you’re actually in ketosis, you’ll need to test blood or urine. One thing that’s critical to understand is the pros and cons of keto. Before you start it, you really should be consulting with your doctor and get a dietitian on board. We’re talking serious potential consequences of this altered metabolism including kidney damage, severe constipation, micronutrient deficiencies (and need for targeted supplementation) including magnesium, omega-3 fatty acids, vitamin C, and sometimes electrolytes. The first 4-10 days on this diet can be tough as metabolism, electrolytes and fluids shift causing the “keto flu” including lethargy, muscle cramps and body aches, headache and gastrointestinal upset. Understand that there isnât one specific keto diet. Everyone is different and people can enter ketosis with varying levels of dietary carbohydrates though most are going to need fewer than 50 grams per day. This also happens at varying amounts of time on the diet ranging from 33 to 58 hours. Some people – especially children – will be admitted to the hospital when starting the keto diet for monitoring and safety. Foods and beverages must be closely monitored, calculated, measured and weighed for many people who need this for medical reasons. This is really serious business. Finally, many people want to know if I’m keto and I’ll tell you honestly that I’m not. The reason is because I’m a vegetarian so I’m not willing to cut out foods like beans, soy, fruit and some veggies in my diet. There are many huge, well done studies that show that vegetarian and vegan diets are among the healthiest diets out there and that they’re linked to decreased rates of heart disease, type 2 diabetes, high blood pressure, and even some forms of cancer. That’s what works best for me. As a registered dietitian, I work with people on a huge range of diets – keto, Paleo, low carb, low fodmap, Mediterranean, DASH, vegan, macronutrient – you name it. My bottom line is making sure that whatever you choose to do is right for you and helping your health and happiness rather than hurting it. Now I need to know what YOU think about keto. Have you tried it? What are your pros and cons? What other questions do you have? Let me know and we’ll continue the conversation together.